Manila—(PHStocks)—Philippine stocks declined on Friday, 2 August, as investors lock in gains amid the rally the previous day. The benchmark Philippine Stock Exchange (PSE) index dropped by 1.91% or 127.49 points to close the first trading week of the month at 6,533.95. 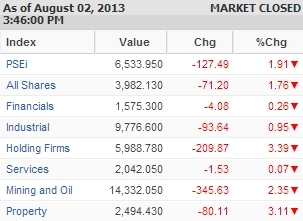 All counters are back in the red, led by the biggest loser, the Holding Firms segment, which dropped by 3.39%. The Property sector followed with a decline of 3.11%, while the Mining and Oil index slid by 2.35%. Overall, the wider All Shares index dropped by 1.76%. Trading was heavy, with value turnover reaching nearly PhP15 billion on 2.15 billion shares traded. According to PSE, foreign buying reached PhP8.29 billion, while foreign selling was PhP4.93 billion. There were 32 gainers against 119 losers, while 40 stocks were flat. Today’s top gainers include SM Investments Corporation (SM, PhP879.00, -8.58%), Metropolitan Bank & Trust Company (MBT, PhP106.00, +0.19%), SM Prime Holdings Inc. (SMPH, PhP16.62, -5.57%), Alliance Global Group Inc. (AGI, PhP26.45, -3.11%), Philippine Long Distance Telephone Co. (TEL, PhP3,074.00, +1.18%), Megaworld Corporation (MEG, PhP3.18, -2.15%), Universal Robina Corporation (URC, PhP124.50, -0.32%), Jollibee Foods Corporation (JFC, PhP155.90, -0.38%), Ayala Corp. (AC, PhP600, -0.58%), Manila Electric Company (MER, PhP277.60, -3.28%).